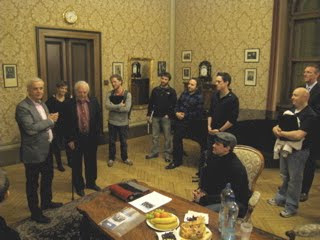 After the warmup we were invited to the conductor's room by Bedrich Plehac, the organizer of our concerts in the Czech Republic and Slovakia, who introduced us to Maestro Košler, distinguished Czech musician and a chorus master, who welcomed us to the hall. He told us that in 2002 he had been in San Francisco for an extended period and had a driver. The first time he got into the car, he said, the driver proposed some music and played Chanticleer singing "Shenandoah." Thenceforth, they rode around San Francisco listening to our recordings. At our concert in Prague two years ago, he had been hoping to hear "Shenandoah" and in fact it had been he who we had heard yell out "Shenandoah" at the time of the encores. Last time, we didn't have it in our repertoire.